Quad L-ite Plus system designed for big sound from small speakers | What Hi-Fi? Oh, and as well as black and white, Wizard of Oz fans can buy the new speakers – which will sell for £1200 for a complete 5.1-channel set-up – in high gloss ruby red. 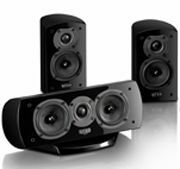 The Quad L-ite Plus is designed to build on the success of previous L-ite systems by incorporating drive unit technology from the company's L-Classic range of full-size speakers. The long-throw mid/bass drivers (one in each satellite, two in the centre speaker) have 10cm cones using Quad's bi-directional Kevlar weave for strength and stiffness without excessive weight, and are driven by a double hand-wound voice-coil and a high powered magnet assembly, mounted in a die-cast aluminium chassis. A profiled phase-plug is used to improving integration with the tweeter. That 25mm tweeter uses a soft fabric dome with a waveguide, also for better integration, and the 25cm-tall cabinets are profiled with smooth, curved surfaces to aid dispersion. The speakers are finished in multiple layers of high-gloss lacquer. An all-new active subwoofer is used in the L-ite Plus system: it houses two mechanically-opposed bass drivers, driven by a 200W amplifier. The drivers use Duo Tri-Lam cones, constructed from a layer of bi-directional woven carbon fibre sandwiched between layers of bi-directionally woven glass fibre. Bass extension is down to 35Hz (+/-3db), or 30Hz at -6dB. The Quad L-ite Plus goes on sale in May and, as well as being available in that £1200 package of four satellites, a centre and a subwoofer, the speakers can be bought separately: the satellites are £250/pr, the centre is £200, and the subwoofer is £600.